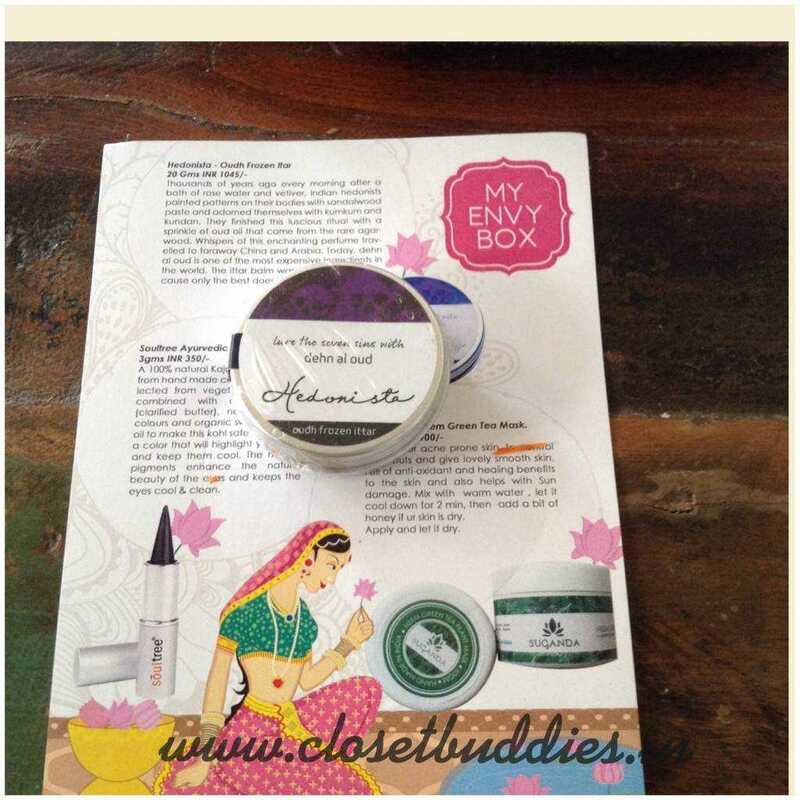 Apologies for not reviewing the July 2015 My Envy Box. I was travelling for most of last month and by the time I got back, it was too late for the review. Can I just say I loooooved the July box! It had 2 full sized products and 2 deluxe sized samples. The total value added up to Rs. 1800 plus! Here’s a list of what I got last month. If you would like me to review any particular product in the box, just write in and I’ll do it :). Ok, so back to the August 2015 MEB. 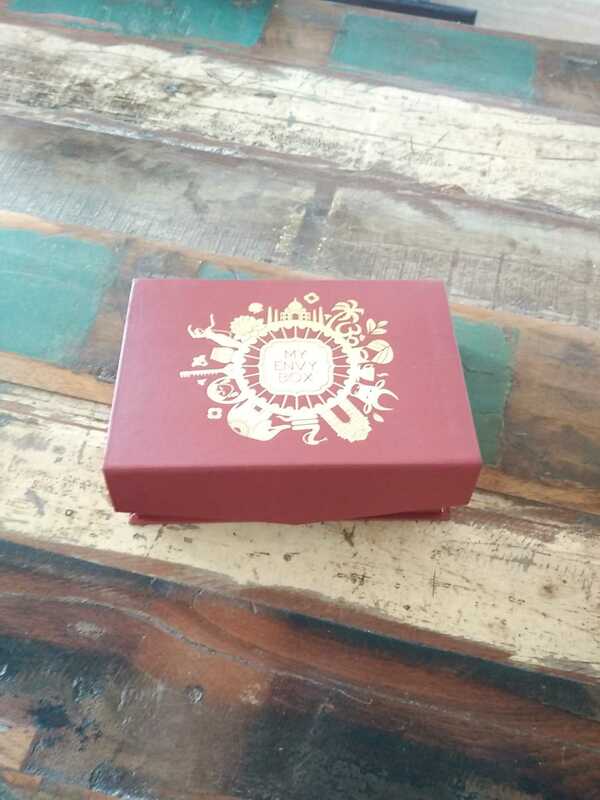 It’s called the India Mon Amour Box. All products are by indigenous brands that use homegrown ingredients. Hedonista is a home grown brand founded by Shagun Sharma. According to her, Hedonista is about gourmet luxury – beauty products that are sumptuous and all-natural but with specialized path-breaking formulations and fragrances. 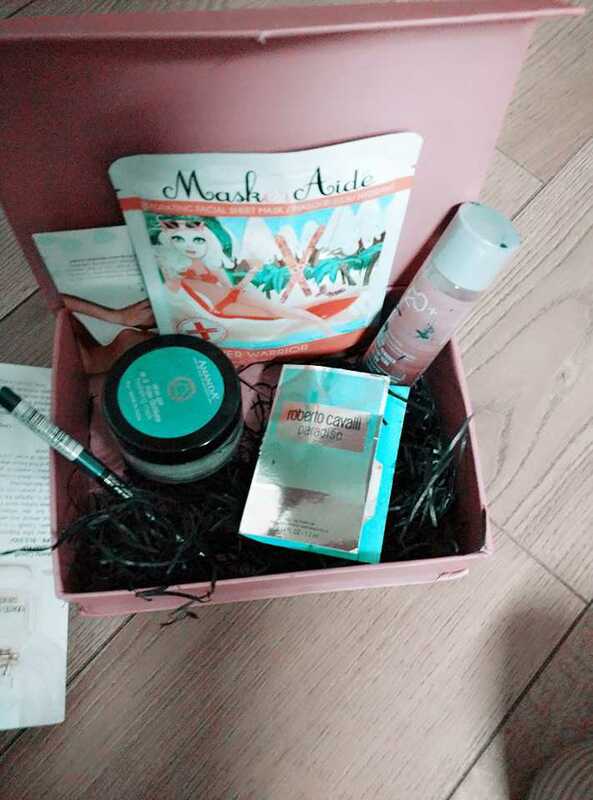 I had received a full sized Face Souffle in my June 2015 MEB and I still can’t get over it’s decadence! The fragrance in the frozen ittar is dehn al oud- apparently one of the most expensive ingredients in the world. The ittar is applied using fingers- behind your ears, on the wrists basically wherever you would spray your favorite EDP. The strong notes are very sensuous, regal and reminiscent of the old world. I like! I’ve received Suganda products in December 2014 and November 2014 MEBs. I am still using the lip balm from Dec and I have to say I quite like it. The green tea mask is especially formulated for acne prone and sensitive skin. It’s also recommended for any sun damage your skin might have been through. Forest Essentials needs no introduction whether you live in India or abroad. I, for one, am a huge fan of the entire range. Don’t you just love the TV ad too? The body mist is made from aloe vera, pomegranate extracts and kerala lime. One whiff and it reminds me on my grand mother, her mandir and Indian weddings! 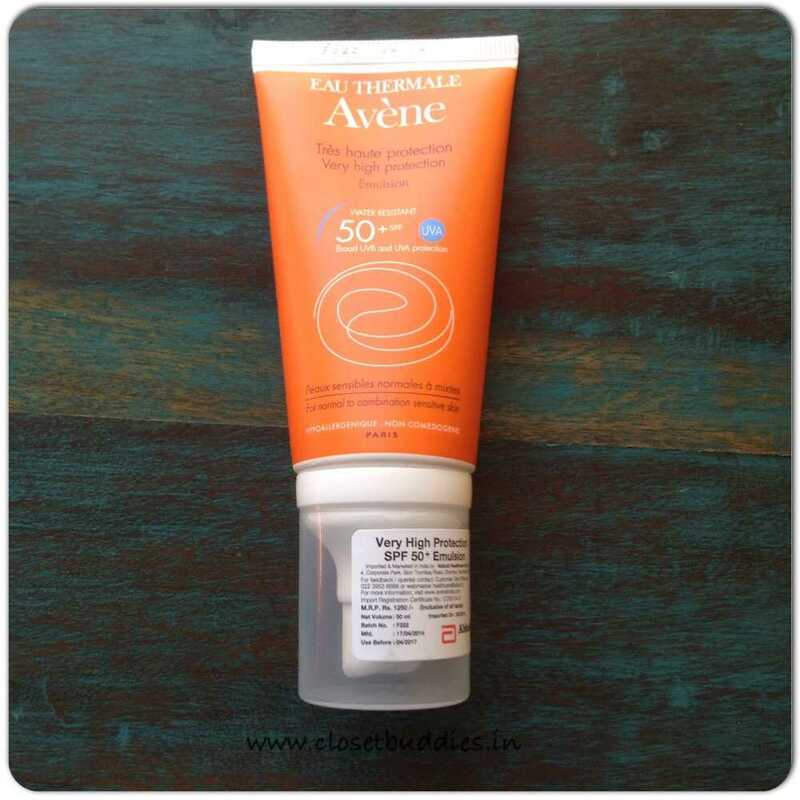 This product is as Indian as it can get! While it makes me very very homesick, I don’t think I am going to stop using it anytime soon. Truth be told, I hadn’t heard of the brand before. The website says their products are made from hand-picked herbs, flowers and wild fruits of the Himalayas. 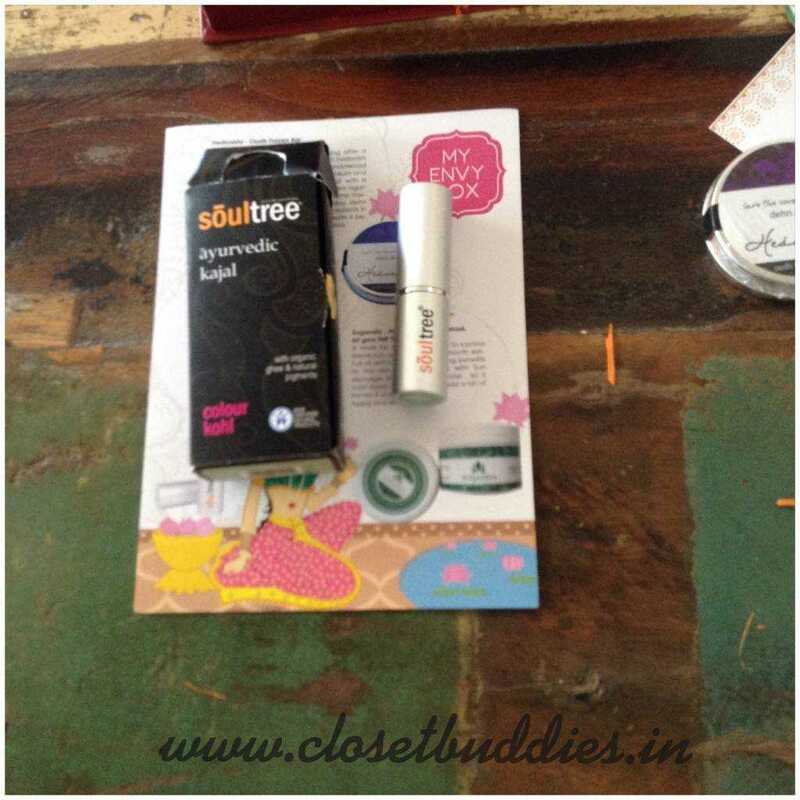 In their words- “SoulTree treats you to the best nature has to offer“. 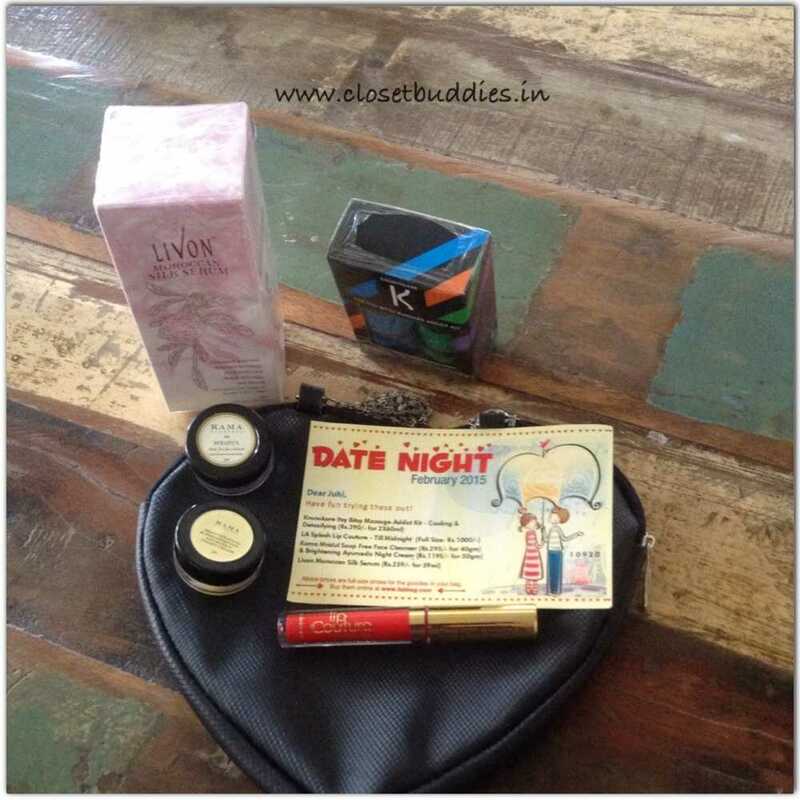 One look at the ingredient list of the Kajal and I have to agree! 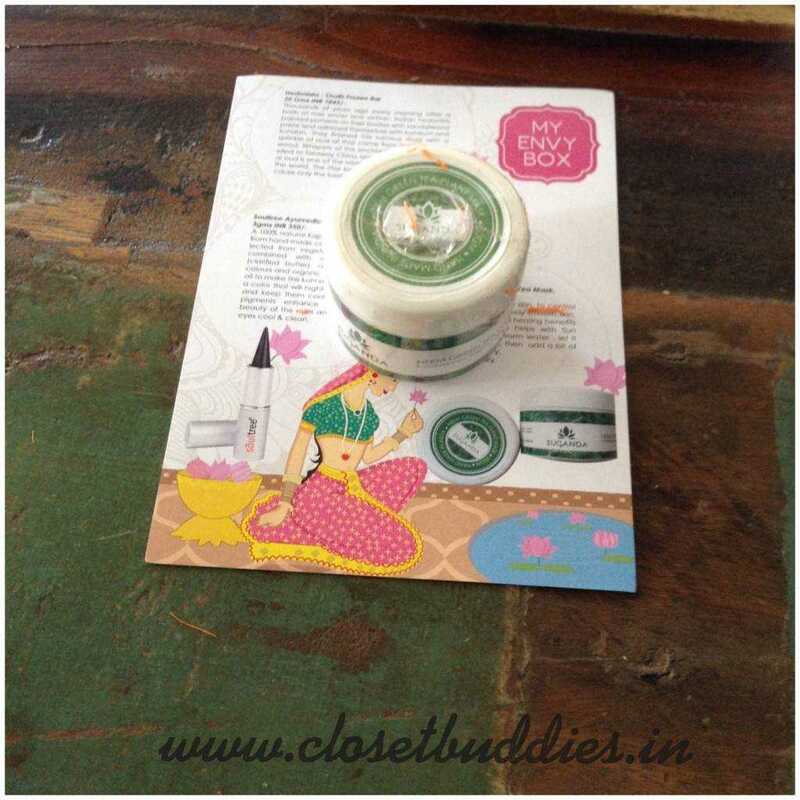 Made from organic ghee, camphor and almond oil- it is every Indian girl’s dream come true! Kajal that also pampers the skin :). They come in over 12 colours. My sample is called Fern Green and I can’t wait to use it! Psst: It can also be used as an eye shadow and it comes off very very easily! So, this was the August 2015 MEB. It’s taken me back to my childhood, when the ingredients were pure and the fragrances so fresh! The samples are all deluxe sized and will last you a while. The box will make for a great gift- to your mommy, granny or even to yourself! There were only 4 samples this month, but I will let it slide. Only because I almost wiped a tear when I smelled the products. (Especially the Forest Essentials Body Mist). The samples add up to a total value of a whopping 2700! But to me this box will remain the most priceless ever! 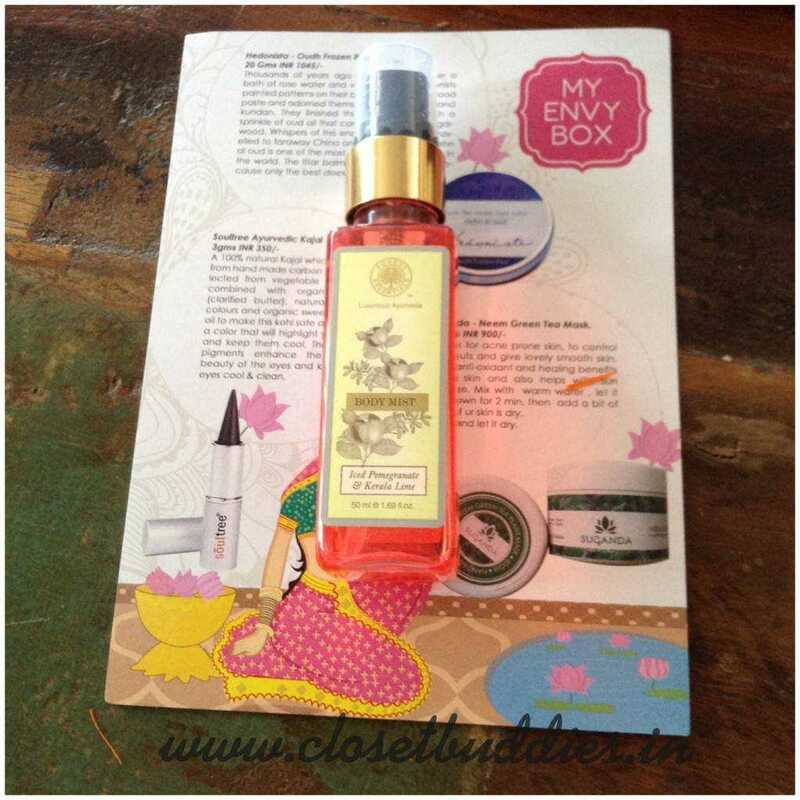 You can order your My Envy Box here. 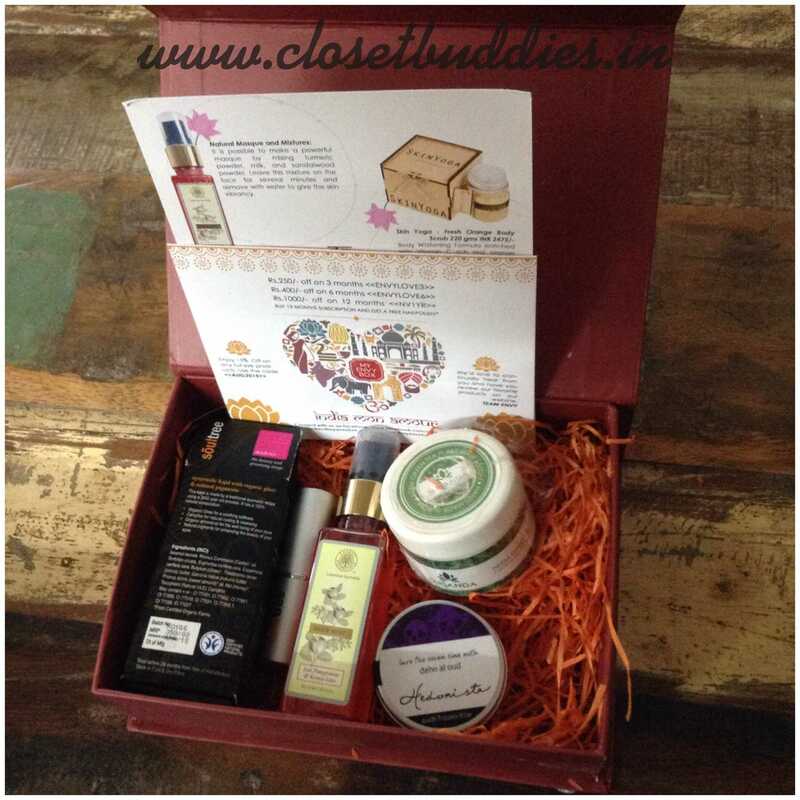 Get 15% discount on all purchases at MEB, use code CLOSETBUDDIES on checkout. Don’t forget to share your experiences with us!